This experiment verifies the dependence of wire resistance on its parameters (length, cross section) and conductor material. This experiment also involves a problem task. where ρ is the electrical resistivity of the conductor, l is its length and S its cross section. Wires made from a material with a large resistivity are called resistance wires. Their resistivity varies from about 0.42·10-6 Ω·m (nickeline) to e.g 1.4·10-6 Ω·m (Kanthal). Note: Equation (1) applies accurately to the wire with cylindrical shape, in which the current flows in the direction of its axis, but this is usually met with a normal wire. Use the ohmmeter to measure the resistance of the wire step by step by 10 cm. Make sure that the wire is properly attached to the ruler by crocodile clips. Plot the measured values in a graph of resistance vs. length. 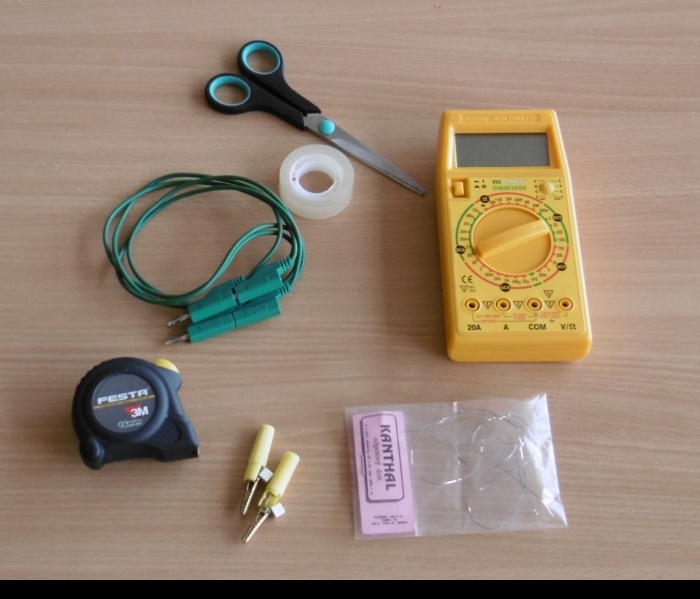 Measure the diameter of the wire and according to the relation (2) determine the electrical resistivity of the wire. Compare the resulting value with the value stated in The Handbook of Chemistry and Physics. This measurement was performed with a Kanthal wire 0.9 meter long with a diameter of 0.7×0.1 mm (the cross section is oblong, not circular). The measured values are listed in the table below. 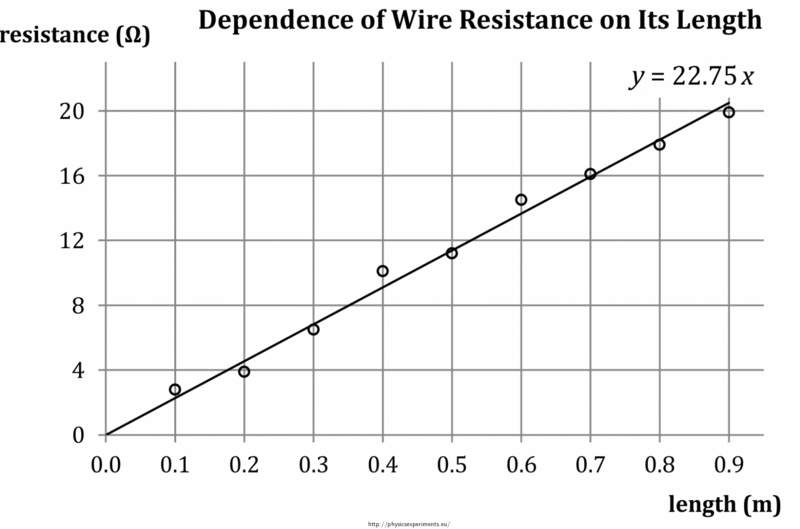 If we plot the measured resistance values in a graph, the gradient of fitted line is the resistance of one meter of the wire. The resistance of Kanthal wire one meter long is about 22.8 Ω. For comparison, the table value of resistivity of Kanthal is 1.4 μΩ·m. The difference between the measured and the table value is given mainly by the contact resistance between the clips and the wire. When conducting this experiment, you need to take into account the transition resistance between the crocodile clips and the wire – pay attention to the correct fixation of the clips; if needed, you can clean the oxidized ends of the wire with a sand paper. 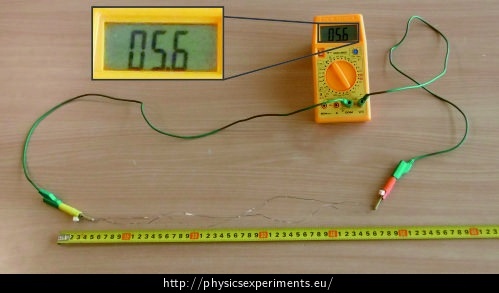 It is necessary to conduct this experiment with a resistance wire, since the electrical resistivity of a copper wire is too small.  What is the resistance of the wire, if we cut it in half and measure the resistance of both halves as shown in Figure 3. The solution is obvious from the equation (1) – the wire cut in half is two times shorter and has twice the cross section, its resistance will therefore be a quarter of the resistance of the whole wire. In our case the resistance is 5.6 Ω. To solve a similar problem, see Electrical Resistances of Conductors of Different Lengths.